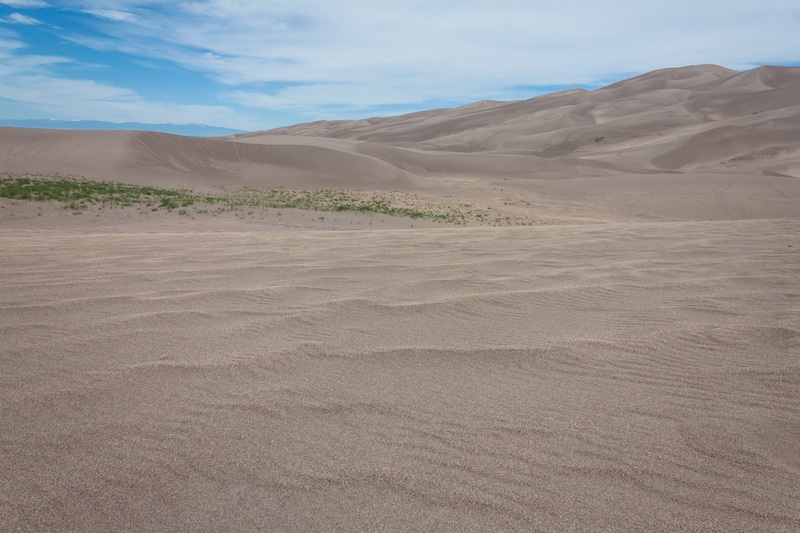 Niels and I have been talking about visiting the Great Sand Dunes National Park & Preserve for some years now, but it always seemed too far away. There were always other places that were easier to access, or we were more enthusiastic visiting (e.g. Yellow Stone National Park, Rocky Mountain National Park, Tetons, Medicine Bow National Forest…). Laramie-Great Sand Dunes is roughly a 6-hour drive on I-25 S. That’s of course only if you’re in a hurry, and there are no car accidents or heavy traffic. Instead of driving whole day, we decided to break it up and stay for the night in Denver. Denver has really lively downtown and we love the big-city atmosphere (big, compared to Laramie, Wyoming). Even though it was still spring, the forecast was promising a hot and sunny day, so we woke up super early with the hope that we’ll somehow avoid the lunchtime heat. It took about 4 hours driving on I-25 S from Denver and the traffic was still ok in the early Saturday morning. For the way back, however, we decided to drive via US-285 N and I-70 E through the mountain. It’s much more scenic and in some days it may even be as fast as the I-25. Very nice road-trip! It was very, very pretty! The pictures turned out ok (see above), but I don’t think they represent very well the scale of the dune field. The only way to comprehend it is to go visit! It was very strange to be surrounded by so much sand and to be far away from a sea/ocean. My best experience during our short visit was crossing Medano Creek. There was something very unusual about it, the streamflow was somewhat irregular. Later I learned that this “surge flow” (see below for more info) is characteristic for Medano Creek. All other visitors, however, were well prepared… kids, teenagers, and even their parents were tubing and enjoying the waves. Also, with all that water flowing down from the mountains, the entire valley was full with blossoming plants and cacti. I still get excited every time I see blossoming cacti. The only tiny somewhat negative experience we had was with the flock of very noisy tourists. From the noisiest type! It was during school vacation, the forecast was promising 30+ C degrees, so probably the entire population of Colorado decided to migrate to river banks, reservoirs etc., to cool at the “beach”. 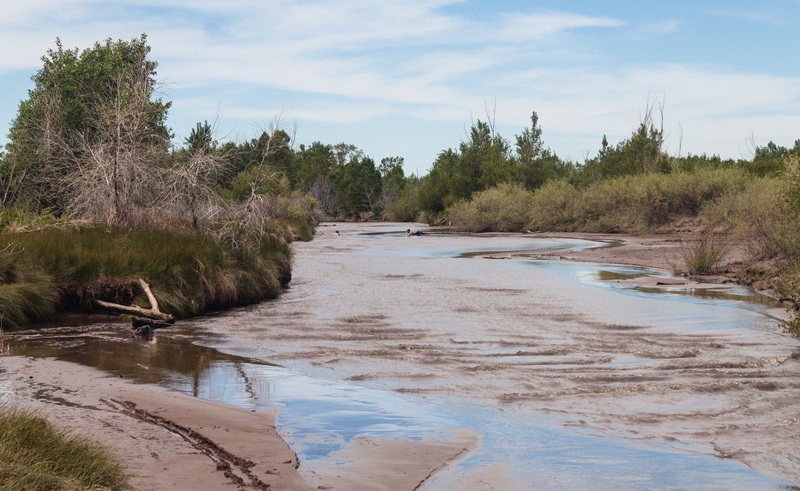 The “beach” at the Great Sand Dunes is actually Medano Creek floodplain, which dries up when the spring snowmelt is over. So, I wish someone told us about these two unpleasant encounters: noisy crowds and (!) mosquitoes along the creek. Lots of mosquitoes! Overall our visit at the Great Sand Dunes was nice, but I enjoyed even more our mini-road trip back to Denver. While driving on US-285 N through the San Luis Valley (see the map above), we saw giant dust clouds moving across the valley… I’ve never seen something quite like this, but it reminded me of the Dust Bowl exhibition at the History Colorado Center. With the strong winds, the arid climate, and almost desert-like landscape, irrigation becomes a necessity for the ranchers and the farmers living in the valley. It seemed that not only the soil erosion, but also salinization are grand challenges for the livelihoods of these people. For most of the hour-long drive through the very flat valley, we had pretty nice view of the Great Sand Dunes, which provided a completely different level of appreciation for the vastness of the dune-field. Our car sound system doesn’t work, so while driving through the Valley we were speculating on the formation of the dune field. The wind erosion and the wind direction were obvious, but still we didn’t really know when did the dune form, how long did it take, and if it is still growing. There were so many questions! Eventually we stopped talking. Partially because we realized that we can’t answer the questions with the information we have, and partially because the road-views became much more scenic, alpine-type of scenic. 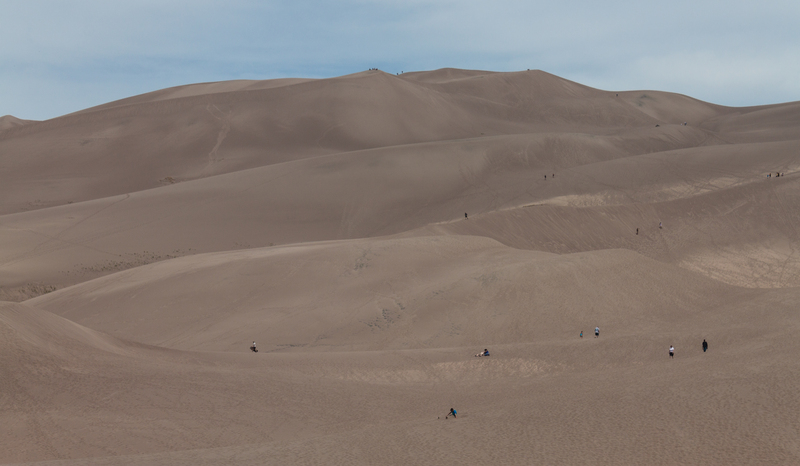 Later, when we got back home, I read about the the Great Sand Dunes, trying to convince myself that this is useful, educational, etc., not just another work-avoiding activity. So, to prove that it wasn’t just a procrastination act, I decided to share here some of the info + some sources for further exploration. I started writing this blog-post September 2017, so it only took 7 months to actually finish it. 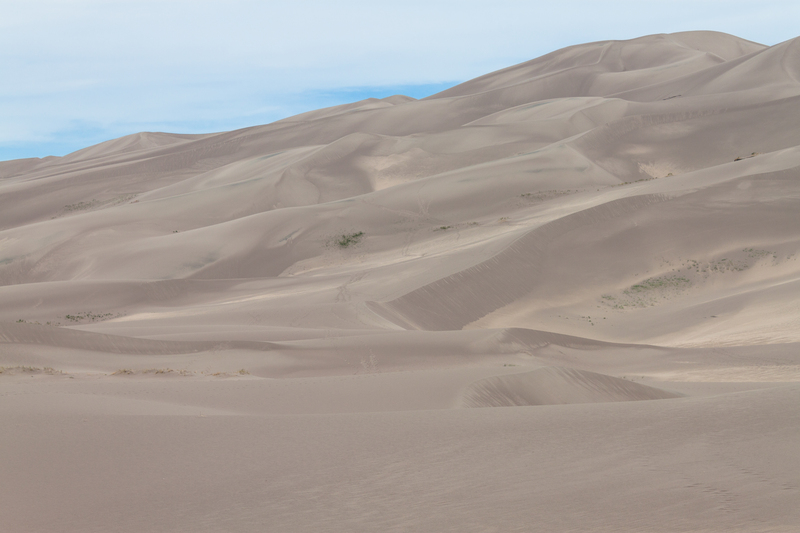 Great Sand Dunes is one of the largest and tallest intermountain dune systems in North America! It’s located in Southern Colorado, between the Sangre de Cristo Range and Rio Grande, in the very flat San Luis Valley (check out the map). San Luis Valley is arid with mean annual precipitation of around 6 cm/yr. However, the local climate at the Dunes is a bit wetter (semi-arid, 9 cm/y) due to the orographic effect of Sangre de Cristo Range. More than half of the annual precipitation occurs as scattered showers in spring and thunderstorms in summer with August being the wettest month. West-South West winds are dominating all year round, but during the summer there are also North East winds and during the night cooler air flows from the mountains to the valley. 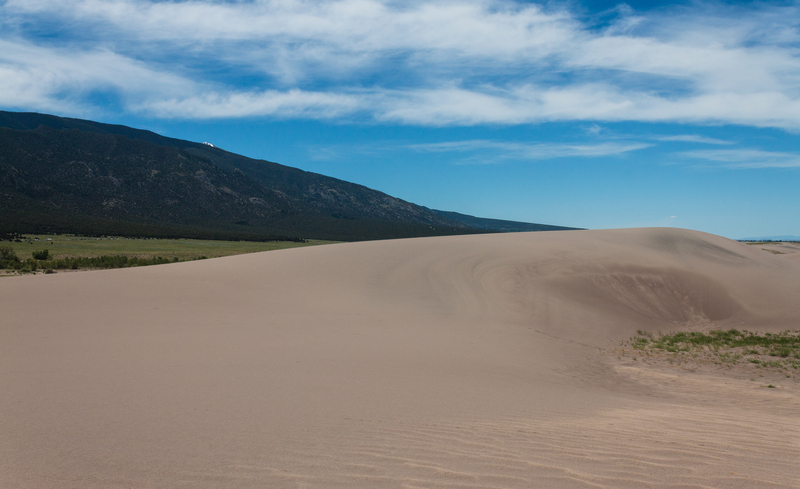 The sand for the Dunes is derived from the alluvium of Rio Grande River, which is blown by the wind across the San Luis Valley. It originated from the volcanic rocks of San Juan Mountain (western limit of the valley) and the crystalline & sedimentary rocks of the Sangre de Cristo Range. The GSD geologic system consists of four components: the mountain watershed, the dune field, the sand sheet, and the sabkha. The dune field (78 sq. km) is estimated to contain about 5 billion cubic meters of sand. Different types of dunes can be seen here: reversing dunes, transverse dunes, star dunes, and few barchan dunes. Some nice pictures and simple explanations about the differences between these types of dunes can be found here. The tallest dune at GSD dune field is “The Star Dune” (it is also a star dune type) and it is 229 m tall. 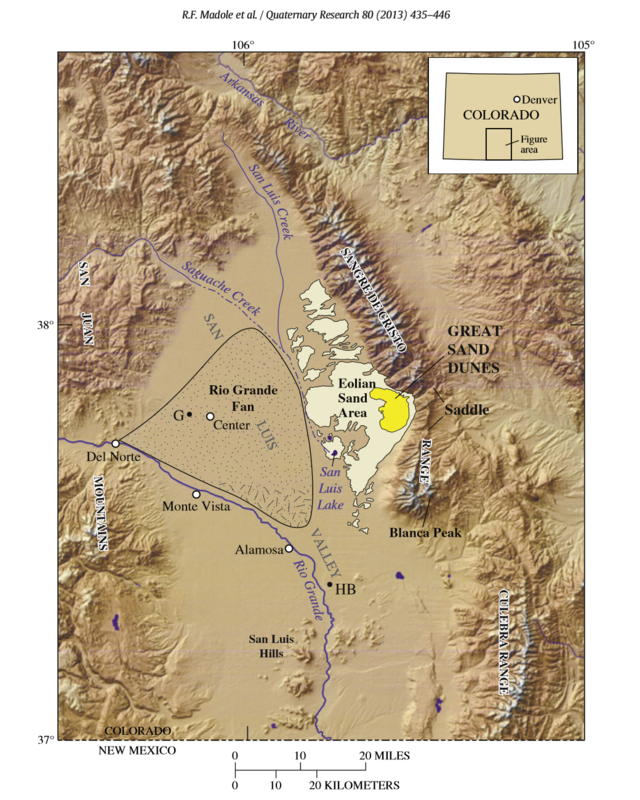 The sand sheet is the flat sandy grassland extending in the three directions at the San Luis Valley (in the fourth direction is Sangre de Cristo Range). 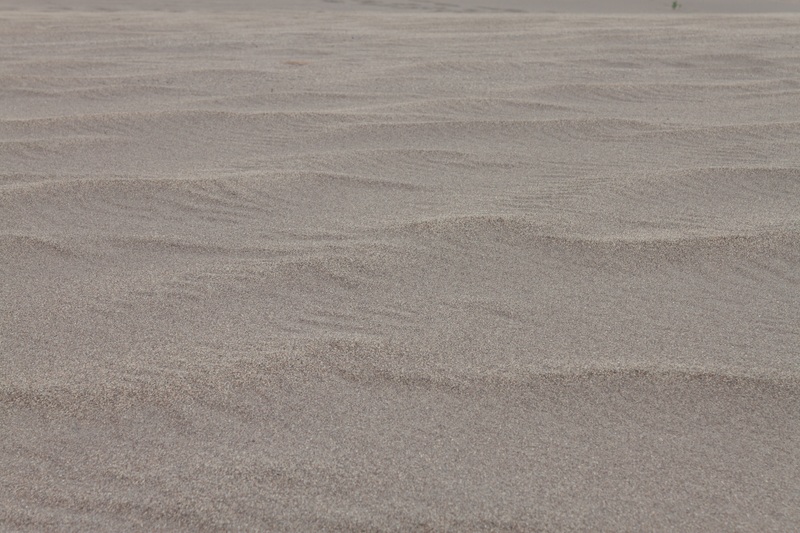 The sand sheet contains about 90% of the sand deposit, while the rest is in the main dune field. 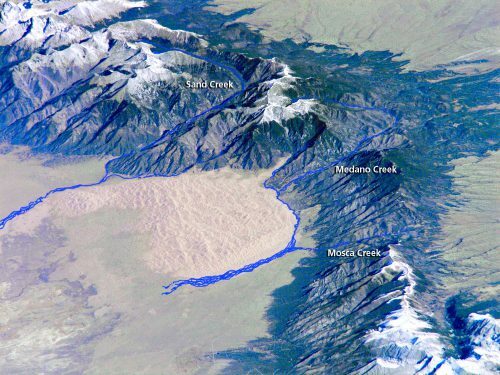 Medano Creek flows at the east and south sides of the dunes and Sand Creek on the north (see the image). Their watersheds span from the alpine tundra and lakes (high elevations), through subalpine woodlands (mid-elevations) in the Sangre de Cristo Range, to the dune field and the valley. The streams are fed annually by snowmelt and occasional rain. The stream water level is dependent also on the groundwater level in the sandy aquifer below the dune field. These two streams are also characterized by “surge flow” (rhythmic pulses of water) which can be observed in the spring and early summer. The “waves” form every 20 seconds and in wet years can be up to 30 cm high. Current conditions and what to expect month-by-month in an average year can be found here. Sabkha is “salt flats” from Arabic and can be found throughout the semi-arid US West (wiki definition). We did not really get to the part of the park where there were sabhas. Marin & co-authors looked at the migration of 13 parabolic dunes and 11 barchan dunes at the GSD sand sheet during the 20th century and tried to answer the question of how did the GSD respond to 20th century North America droughts (1930s, ’50s, ’60-’64, ’71-’74, ’77-’78, ’89-’90, 2000-2004). This paper extends the period of interest (from the previous one) to the late Holocene (~1300 years). Five potential depositional eolian events were recognized (in the conclusions part referred to as “dune reactivation or formation“ events): 1290–940, 715 ± 80, 320 ± 30, and 200–120 y ago and in the 20th century. Eleven decadal-scale droughts were identified for the semi-arid Sand Luis Valley which were also consistent with reconstructed PDSI prolonged droughts (>20 years) during the 8th, 11th, 12th, 13th, 16th, and 20th century. The most interesting part of this paper is the discussion on these past droughts and human migration patterns known from archaeological sources. This one is a bit different from the previous two. Lorenz & Valdez used time-lapse images to study the wind movement of ripples on one of the parabolic dunes in the GSD during a 70 day period. One of the findings was that movements occurred during “a handful of discrete events”. The most interesting part of this paper was the very detailed description of what went wrong… from freezing temperatures (-20 C in the night) and camera malfunction, to unexpected snow covering the ripples, to tumbleweed strolling in front of the camera, to fox and coyote being curious about the new box (camera attached on a pole) in their area. There is also a time-lapse video in the supplementary materials… quite cool. 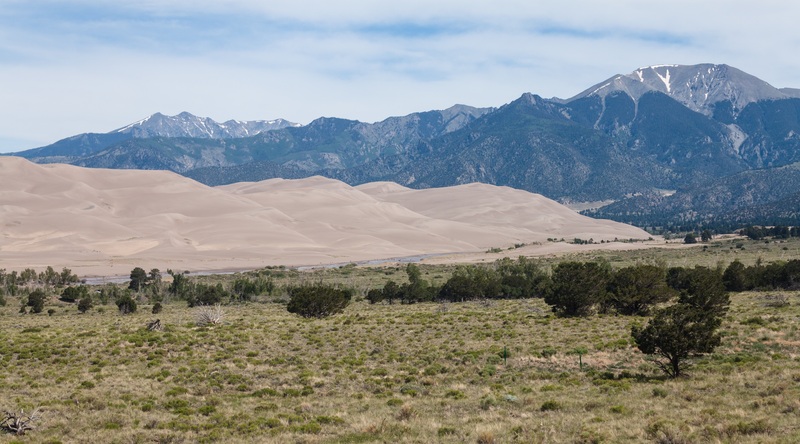 Madole and co-authors say it is yet to be determined precisely when the Great Sand Dunes began to form. But they narrowed down the possibilities of dune formation somewhat: (1) the formationwas linked to glacial times, (2) after the ancient Lake Alamosa had drained, (3) but the dune formation lagged the withdrawal of Lake Alamosa long enough for a massive wedge of piedmont-slope to be deposited over the lake sediments (i.e., the Alamosa Formation), and (4) large sand dunes were present in the range-front between 65 ka and 130 ka (next glaciation).